Let's talk about Hydro-Luge! I'm guessing most people here wouldn't miss it if it was gone, but I think every ride has somebody out there that loves it. Even this one. I've just been thinking about this ride recently and was wondering about a few things. 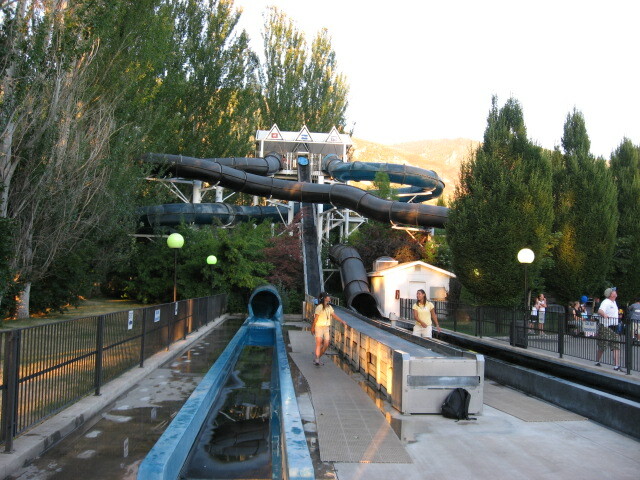 Did Lagoon ever have plans to add slides to the tower? Why do they limit the amount of people on the stairs? It doesn't seem like it would be that unsafe. To me it seems like they put less thought into picking Hydro-Luge than any other ride in the '90s (and maybe ever since). It's like they realized they hadn't been adding any new rides for a while and quickly picked something in a low price range at the last minute. Not only were there no new rides for two seasons leading up to that, they had been removing a lot of stuff too (Wild Mouse, Fun House, Tri-Star). How disappointing it must have been after all that and to have a new ride be a water slide you ride with your regular clothes on, just six years after Lagoon-A-Beach opened. I really wouldn't be too sad if they took this out and it seems like a good spot to put something new. There is a fairly big lawn right behind it. For that reason, I also didn't much enjoy working it. You either got stuck at the bottom, which guaranteed you spent most of your day wet, or you got stuck on the tower staring into the sun for hand signals from the bottom. I don't ever recall there being a limit on the number of people on the stairs when I worked there, so I'm assuming that's a new addition to the policies. When it opened, that entire staircase was jammed with people top to bottom and around the corner, so it couldn't be a weight limit (unless they've since changed materials or the materials have weakened with age). I'm with you -- I wouldn't miss it if it were gone, but I get that some people have a thing for water-based rides, so I can see why it'd have some appeal. I think it's probably more unique to have in that spot vs. whatever flat ride that would go there, so I don't see it as a problem to keep it. Except of course if it starts becoming a maintenance headache, and then, yeah... dump it. I seem to recall it was very cantankerous to keep running right even when it was new, but I'm sure they ironed out most of the eccentricities pretty early on in its life. (08-01-2015, 09:02 PM)DragonTamer Wrote: I don't ever recall there being a limit on the number of people on the stairs when I worked there, so I'm assuming that's a new addition to the policies. When it opened, that entire staircase was jammed with people top to bottom and around the corner, so it couldn't be a weight limit (unless they've since changed materials or the materials have weakened with age). The limit was put on the ride for safety concerns for evacuation of the stair case. One side of the stair could be loaded at a time. I say rip it out. The land would be much better utilized. (08-01-2015, 09:51 PM)Coasters Wrote: The limit was put on the ride for safety concerns for evacuation of the stair case. One side of the stair could be loaded at a time. I remember when it first opened, and yes, we waited on the stair case. I rode it once and thought it was stupid. The White Water West "Water Coasters" were all the Rage in the early to mid 90s, with Six Flags having the Largest Amount at Magic Mountain and Great Adventure. I think a HUSS Giant Frisbee would look great in that Location. I was really hoping with the opening of Cliffhanger, then OdySea, that with the addition of those Water Rides, they would take a bulldozer to Hydro. There was a rumor when I worked there that Lagoon wanted to add two slides that would go out the other side of the tower, but I think it was nothing more than employees speculating and spreading rumors. I do remember when it originally opened, and you had to pick a side before you started waiting on the stairs. It was a pain for the employees to go up or down the stairs when it was jammed full of people. I think '97 may have been the first year they started limiting the number of people on the steps or the year just after. I do remember being one of the employees at the bottom of the tower regulating how many people were up on the steps. I too would like to see something replace it. Hydro doesn't really seem to be as popular as it once was unless I just don't pay attention to the line anymore, but I recall the queue being filled quite a bit. Rattlesnake Rapids really cut down the line when it opened. Before Rattlesnake, Hydro's wait easily reached upwards of 60 - 90 minutes. Now days I rarely see much of a line when I head past. I thought I remembered that the staircase was divided for which slide when it first opened, but couldn't be sure I was remembering that right; thanks for confirming that for me! I do remember how much of a pain it was getting up & down the stairs for rotation/shift change/breaks. I swear it took you half of your break just parting the crowd! I think the canopy up top was a later addition too, right? I swear I don't remember that being there when it opened. Could be losing my mind... I spent most of that summer glued to Flying Carpet. I wouldn't be upset if they took it out, but I have enjoyed an occasional ride on it this summer on hot days because it has almost no wait and gets me wet enough to cool down for a while. Plus it's near Cannibal and a couple of my favorite flats in the park. There's always Rattlesnake Rapids but that's away from all the other rides and has a very long line on hot days. It was really nice to get drenched before standing in the sun for 4 hours waiting for Cannibal to open on July 4. (08-02-2015, 02:12 AM)DragonTamer Wrote: I think the canopy up top was a later addition too, right? I swear I don't remember that being there when it opened. Could be losing my mind... I spent most of that summer glued to Flying Carpet. The canopy has always been there as far as I can remember. I tried to see if I could track down a picture of the tower when it first opened up to check, but I couldn't find one. (08-02-2015, 11:40 AM)jonskinny12 Wrote: I wouldn't be upset if they took it out, but I have enjoyed an occasional ride on it this summer on hot days because it has almost no wait and gets me wet enough to cool down for a while. I try to ride it a few times per year, usually if my son Dakota is with me.